Bike for Peace is a Norwegian based organization that seeks to initiate and develop a grassroot concern for the local environment, as well as creating an understanding of the national and global consequences of the actions of individuals, communities and campaigns. The first campaign was run in 1978 in Northern Ireland. We work for peace, and our common environment, across regions and nations, languages and cultures. In 1999 Bike for Peace organized the Worldwide tour 1999 from Beijing through China, Kazakhstan, Russia, Finland, Sweden and Norway, covering a total of 11 470 km. In 1977 Helge Hundeide og Tore Naerland started their first international bicycle tour which they called “Bike for Peace”. This first tour was Coast to Coast in the USA, Seattle – Washington DC. Since 1978 Bike for Peace has organized peace and friendship rides in more than 104 countries. 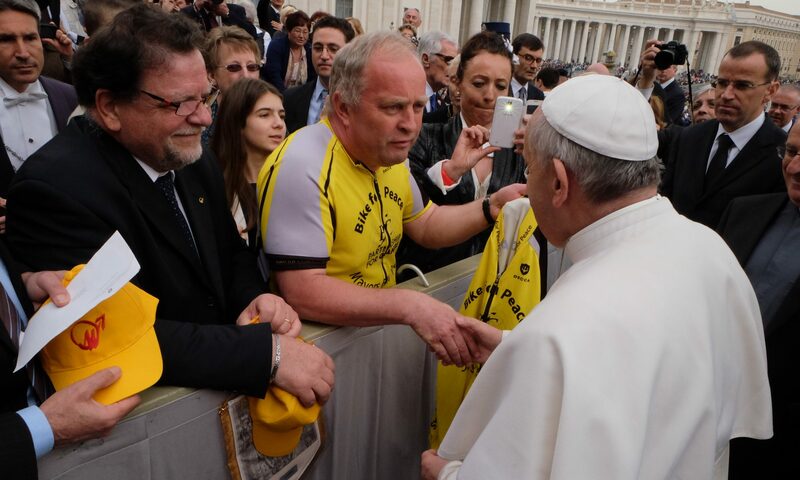 During its tours, Bike for Peace has met many well-known political, religious and cultural leaders like Pope Johannes Paul II, the former General Secretary of the Soviet Union Andreij Gromyko, the General Secretary of the United Nations Boutros Boutros Ghali and Perez de Cuellar, the former President of Poland Lech Walesa, Pres. Mary Robinson, the General Secretary of the National League for Democracy of Burma Aung San Suu Kyi and others. The leader of Bike for Peace, Tore Naerland has been fighting for peace, disarmament and democracy on the planet for almost 30 years. Naerland studied history, political science and communication at the Concordia College in Moorhead/Minnesota. He has been promoting peace by organizing biking and cultural tours in various countries since 1978 and inspired many to join his ideas. During the last 40 years, we in Bike For Peace have received several awards and recognitions for our peace-work all over the world. In 2015 Bike For Peace and Tore Naerland were awarded the Gandhi Foundation International Peace Award in a ceremony in the House of Lords, in London. In 2017 Tore Naerland received the Norwegian Kings medal of honor, for his relentless efforts for world peace. Bike for Peace have on 8 occasions been nominated for the Nobel Peace Prize, and also the Gandhi International Peace price, the Kazakhstan Peace Price and the Coventry Peace Price. The ATOM project of Kazakhstan have helped us and cooperated with us on many tours the last years. The goal is to achieve in force the Comprehensive Nuclear Test Ban Treaty through online petitions and other methods. Kazakhstan has historically been concerned about nuclear issues because of the Semipalatinsk Test Site, which is where the first Soviet nuclear weapon was exploded in 1949, with 456 more to follow until 1989, it was the primary Soviet nuclear test site.Many people in Kazakhstan suffer from cancers and birth defects related to radiation poisoning. Merida Industry Co., Ltd (MIC) is a Taiwan-based bicycle design, manufacture, and sales company with R&D headquarters in Germany. It was started in 1972 by Ike Tseng. Merida is a global player in bicycle design and manufacturing, making 2.2 million bicycles a year at five factories: one in Taiwan, three in China and one in Germany. Merida produces mainly its own Merida-branded bikes, which are present in 77 countries around the world, or selected brands which it has a financial interest in, such as the the German brand Centurion. Merida has been co-sponsor of the Multivan Merida Biking Team, with athletes such as Jose Hermida and Gunn-Rita Dahle Flesjå, and of bicycle racing events such as the TransUK and TransWales mountain bike races.Since 2004, the team has been scoring over 30 World Cup wins as well as Olympic gold and silver medals. In 2013 Merida became co-sponsors of the Pro-Tour Lampre-Merida road racing team and changed to Bahrain–Merida Pro Cycling Team in 2017. We are very proud to be part of the Merida team! Please visit their Norwegian page here to read more!